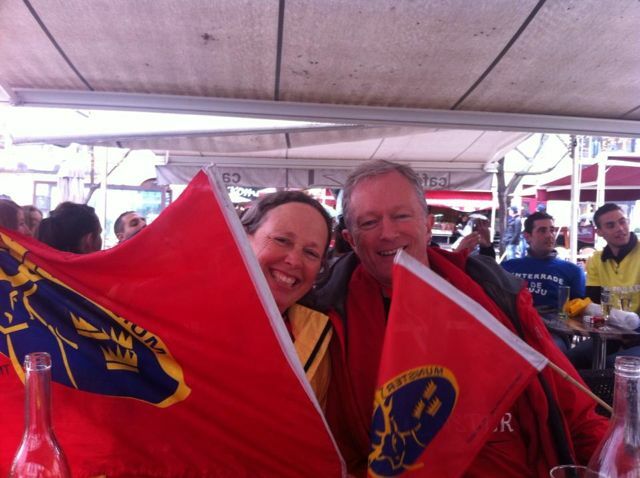 The weather was just awful as we loaded our Munster flags and our Munster-jersey clad bodies unto the jeep. 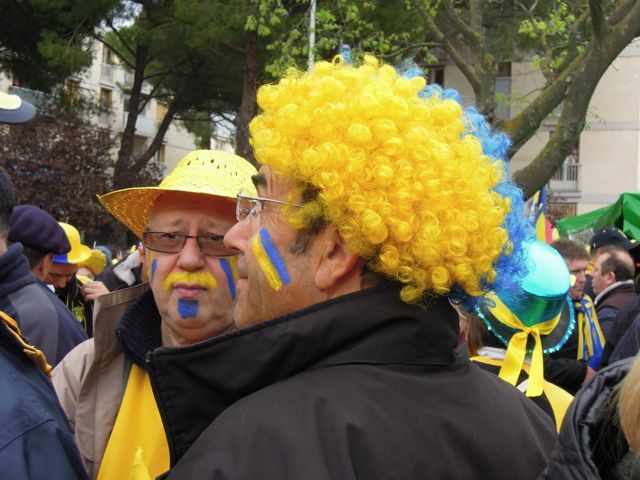 It remained steadfastly awful as we drove to Montpellier, just over two hours away, and the awfulness continued as we parked the car and splashed through the streets of Montpellier to meet up with our niece (a Leinster lass, it must be pointed out) and her hubby (a staunch Munster man). 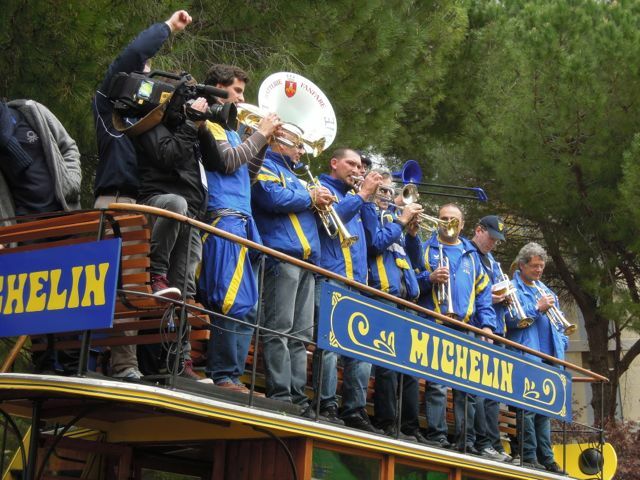 We sat and bemoaned the rain under an umbrella in front of a café, and compared every weather forecast going – France Meteo was the most optimistic, but was also the most wrong, seeing as it kept insisting that the sun was shining in Montpellier at that very moment. 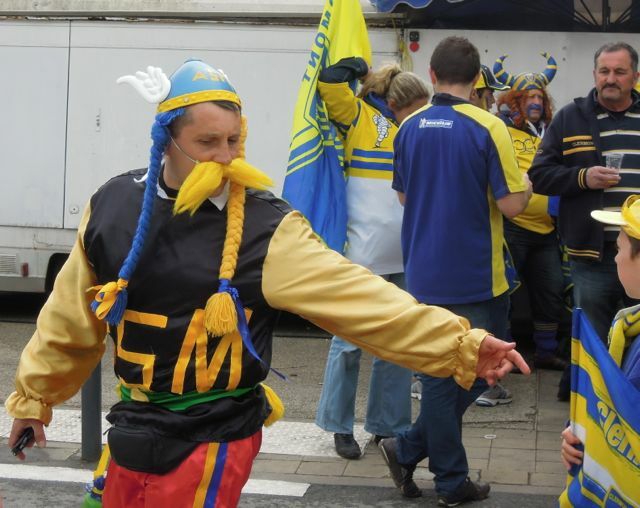 Finally, the rain stopped just as we made our way to the tram that would take us to the stadium, and when we arrived at the Stade Mosson and met The Yellow Army, the party atmosphere took over and banished all thoughts about the weather. 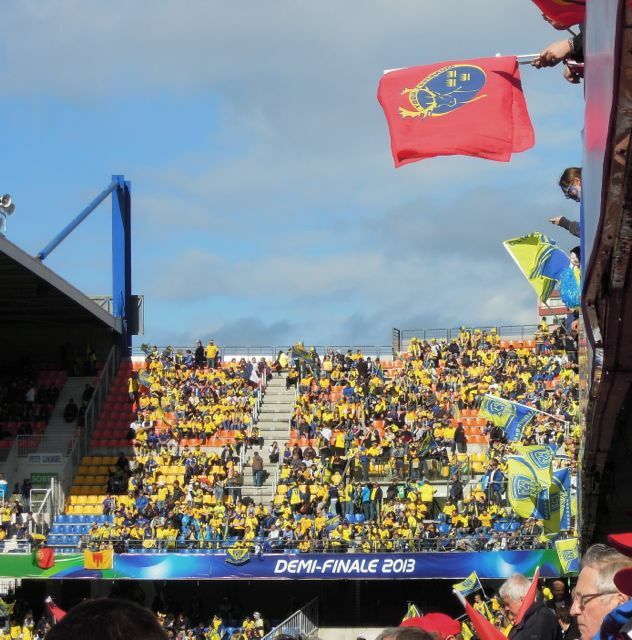 Here Vitalstatistix is waving a Munster flag and a Clermont-Auvergne flag to be fair and equable. 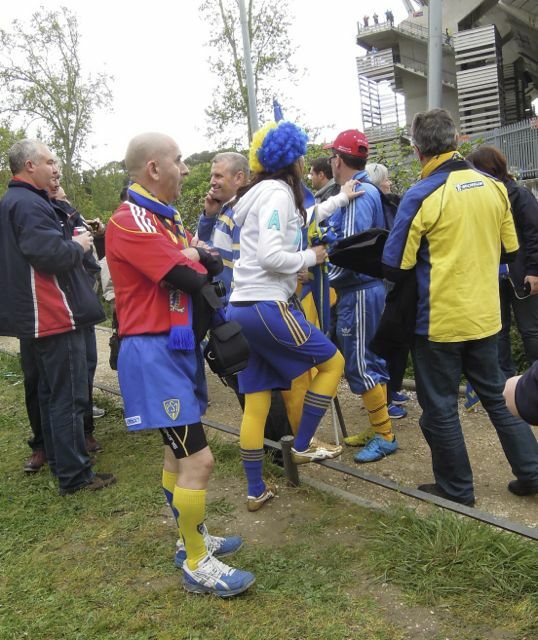 although this guy seemed a little confused – a Munster jersey with Clermont shorts and socks? 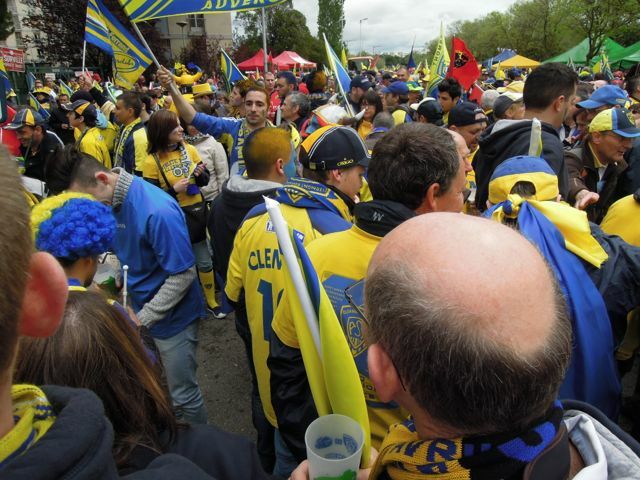 Once we were in the grounds and settling down for the match, the crowd really got going. The noise was phenomenal, especially down at pitch-side, but the Red Army fought back valiantly and refused to be outsung. Anyway, to the most important part of the day – the game. Munster came into the game as out-and-out underdogs. 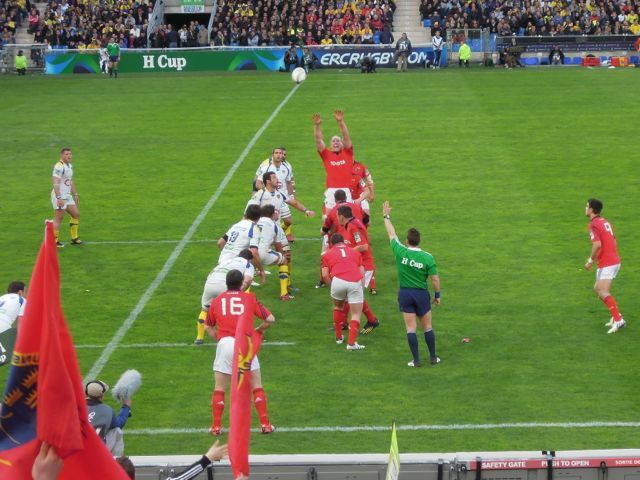 Clermont scored an easy try within the first ten minutes and we were thinking “Oh crap, this is going to be embarrassing…” but Munster rose to the occasion and were unlucky, in the end, to lose. 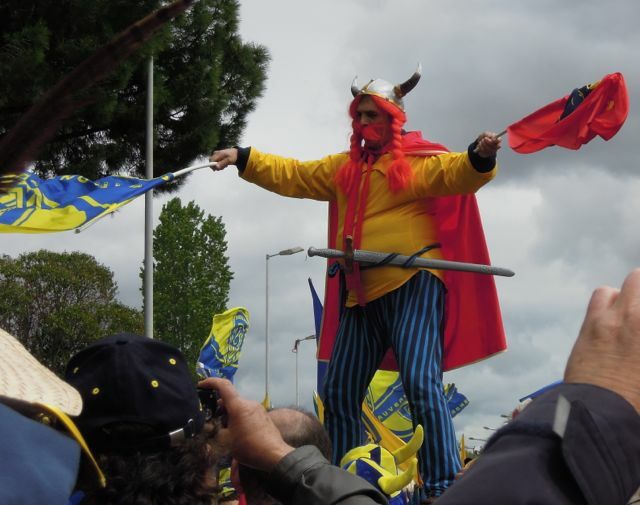 Something tells me this is Clermont-Auvergne’s year to be European Champions – we’ll know in just under three weeks time when they take on Toulon in Dublin. 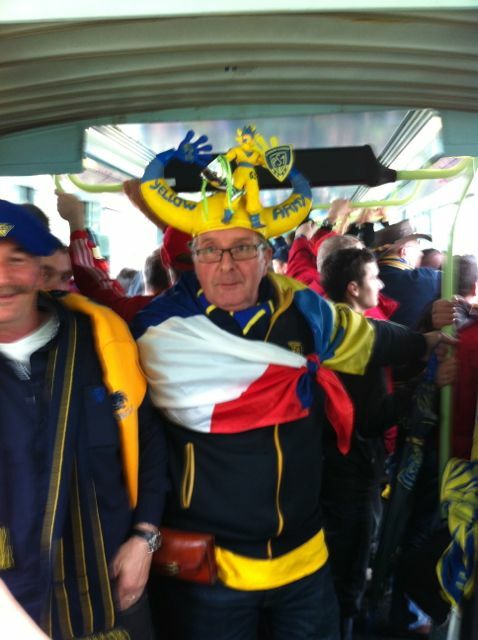 One thing’s for sure, Dublin won’t know what hit it when the Yellow Army arrives. Oh, and FINALLY, I did something I’ve never done before – I bought a saddle on e-bay. It arrived on Saturday but I haven’t had a chance yet to try it on Aero. Gulp. Hope it fits! Looks like you had fun despite the weather. Looks like a great time was had by all. Loved your pictures. 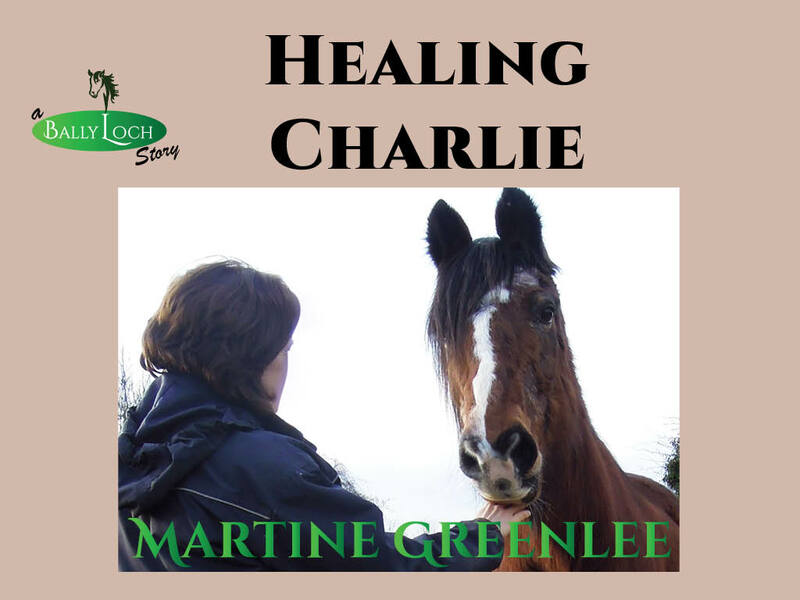 there’s a blog post on the way about the saddle…. Oops, fixed now if you want to go try it again! Yup, absolutely mental, absolutely brilliant!